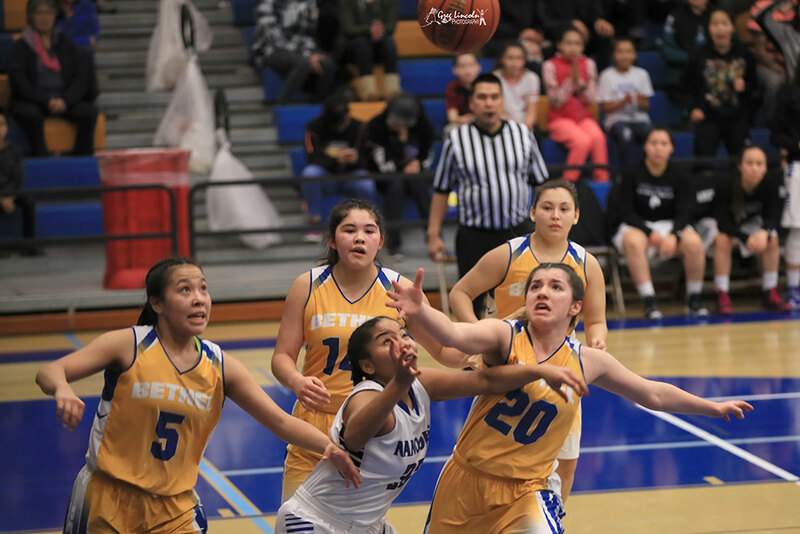 Mute helps Lady Warriors earn split with Nome - The Delta Discovery, Inc.
Nome Nanook's #32 Daynon Medlin is surrounded by Lady Warriors on the rebound. From left are #5 Jaron Mute, #14 Ava Lieb, #23 Andrea Lee, and #20 Fiola Dema during last Saturday's game. Jaron Mute didn’t just save the Bethel Regional High School Lady Warriors once this past weekend, she did it twice. In the same game. 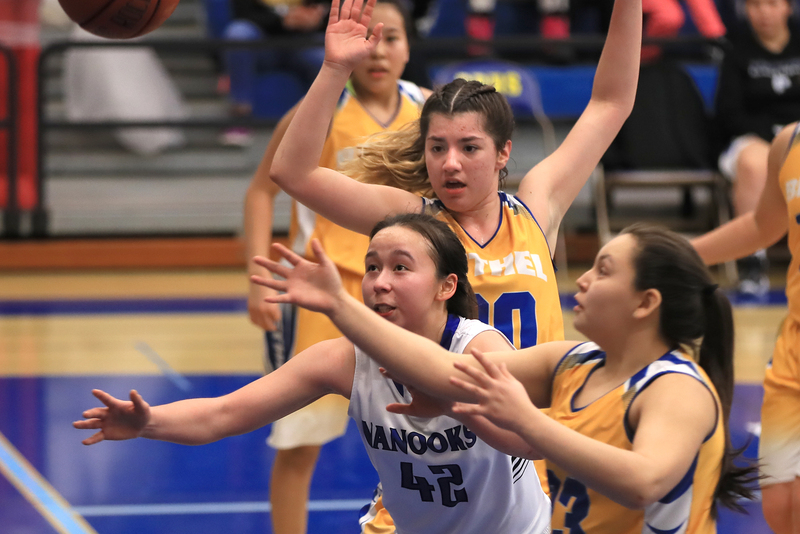 And, as a result, the Lady Warriors rolled to a split of their two Western Conference games with the Nome-Beltz Lady Nanooks at the WarriorDome. The two teams played a weekend doubleheader beginning on Friday in front of a large crowd. 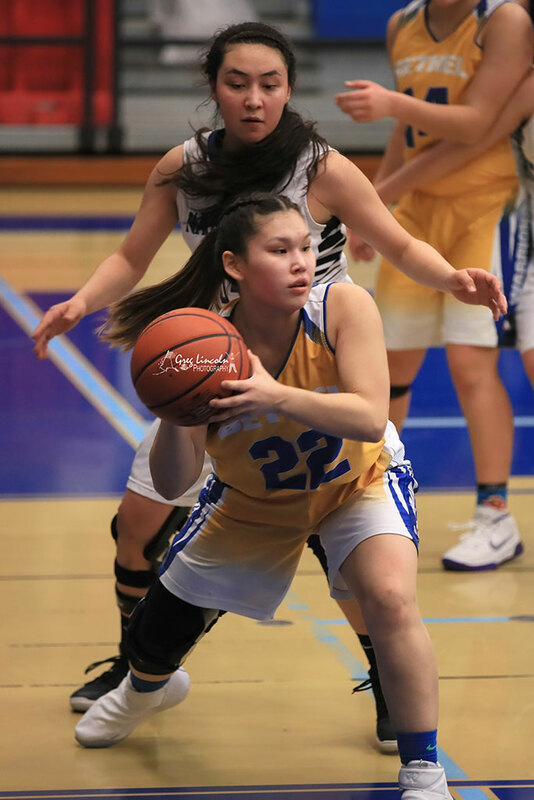 The biggest of Mute’s two game-saving shots came in the waning seconds of the Lady Warriors’ 58-57 overtime victory on Friday. 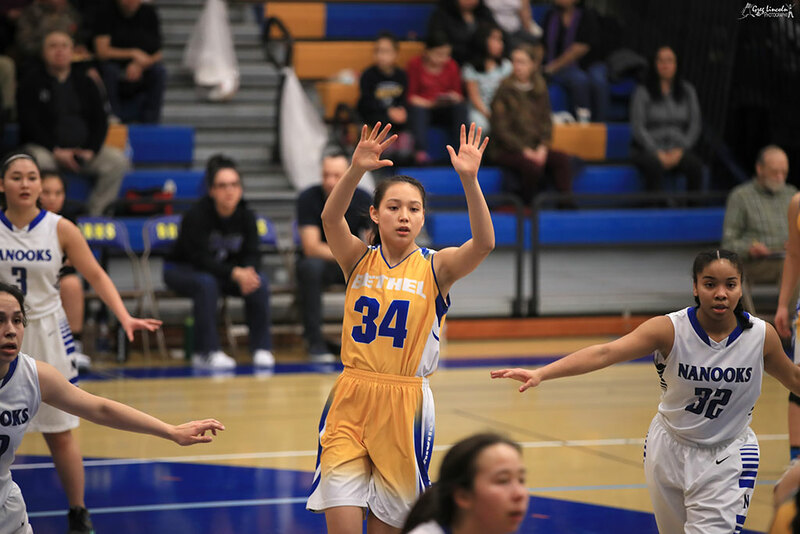 With Bethel trailing by two, at 57-55, with time running out in OT, Mute pulled up from behind the three-point line and buried a game-winning basket. Her basket gave Bethel a wild one-point win. 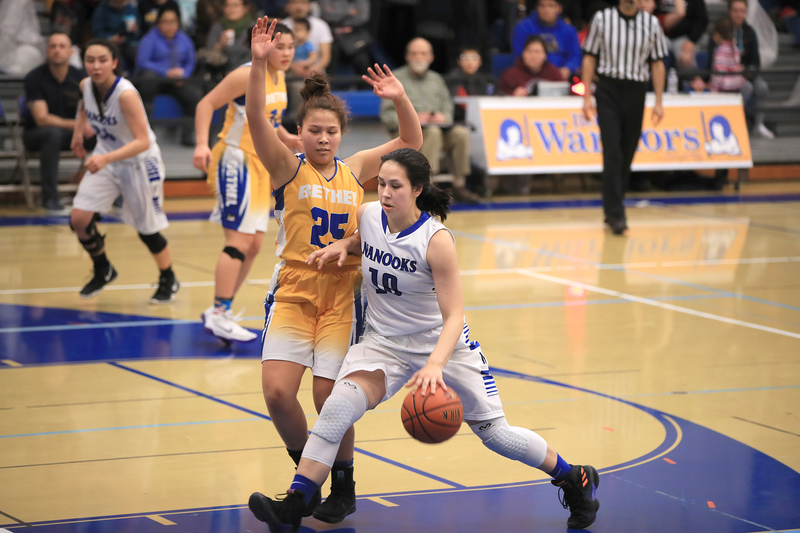 Ava Lieb provided the bulk of the Lady Warriors’ offensive success in OT. She poured in seven of her 16 points in the extra frame. 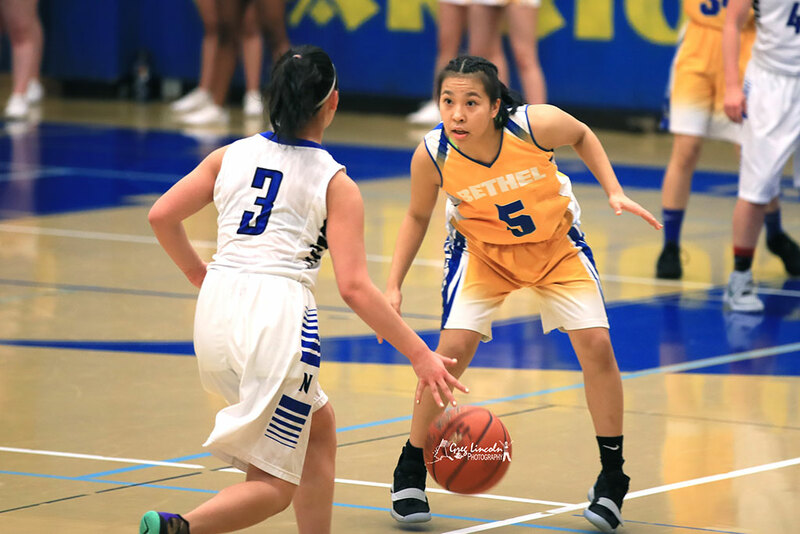 Her seven-point outburst helped Bethel stay close in the OT period, and gave Mute the opportunity to notch the win with a buzzer-beater. 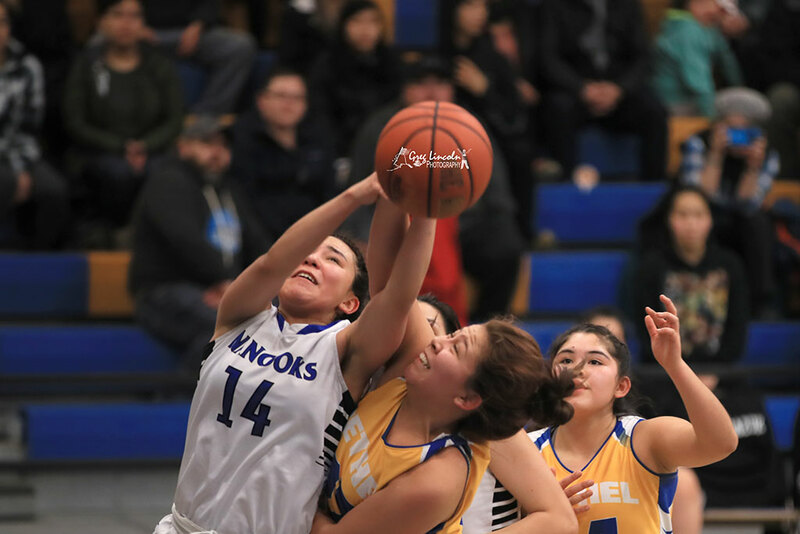 Nome and Bethel had entered the OT frame with the score knotted at 48-48. 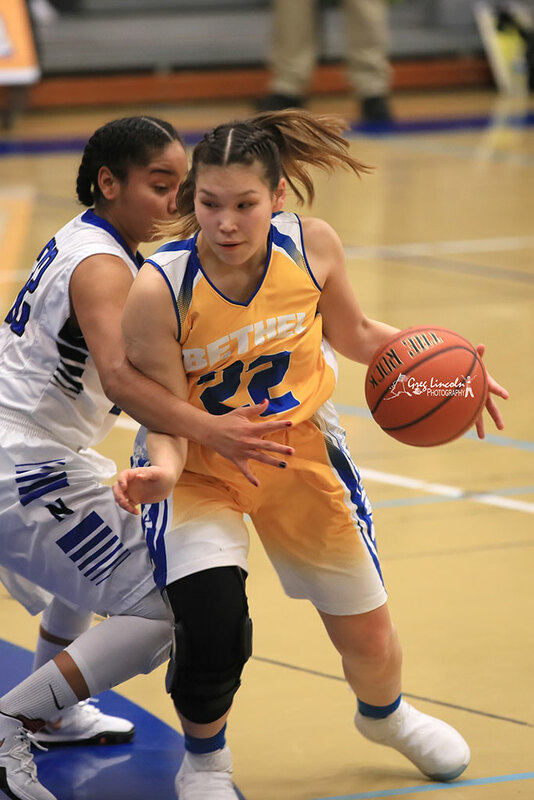 Fiola Dema and Brianna Evan helped Bethel rally from a first-half deficit by turning in a stellar effort in the fourth. 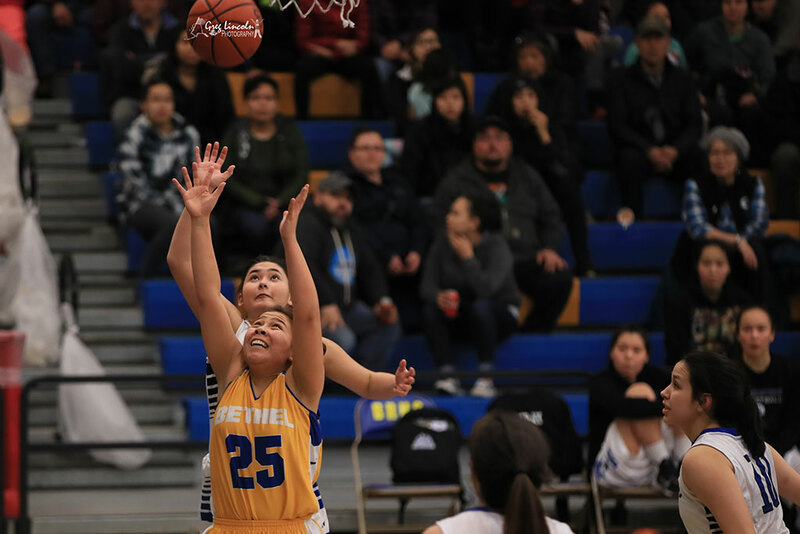 Evan pumped in five of her 12 points in the final eight minutes of regulation and keyed a 11-point run that helped Bethel move to within 48-46 with less than 15 seconds. Mute came away with her first key shot from there. After taking a long pass into the frontcourt, she pushed home a shot with just 8 seconds left to force OT. Dema contributed four points in the fourth, while Lieb chipped in a pair of clutch free throws. 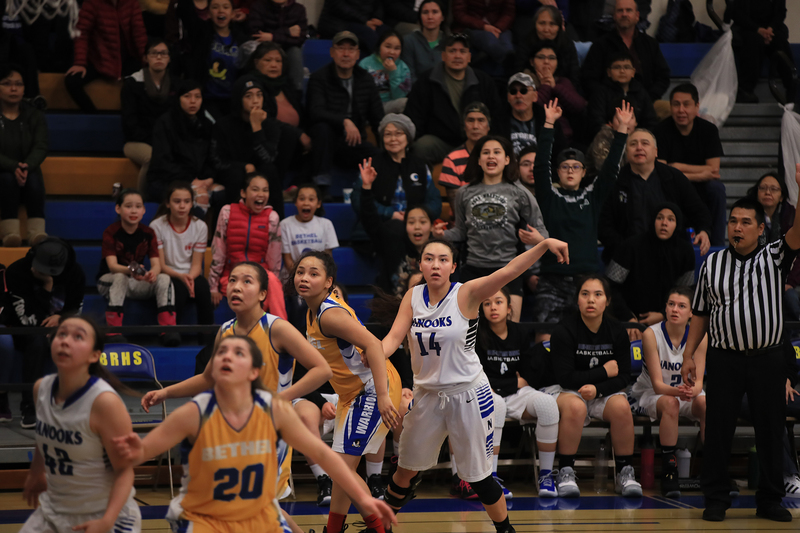 Nome, sparked by six first-quarter points by Kastyn Lie, raced to the early lead. 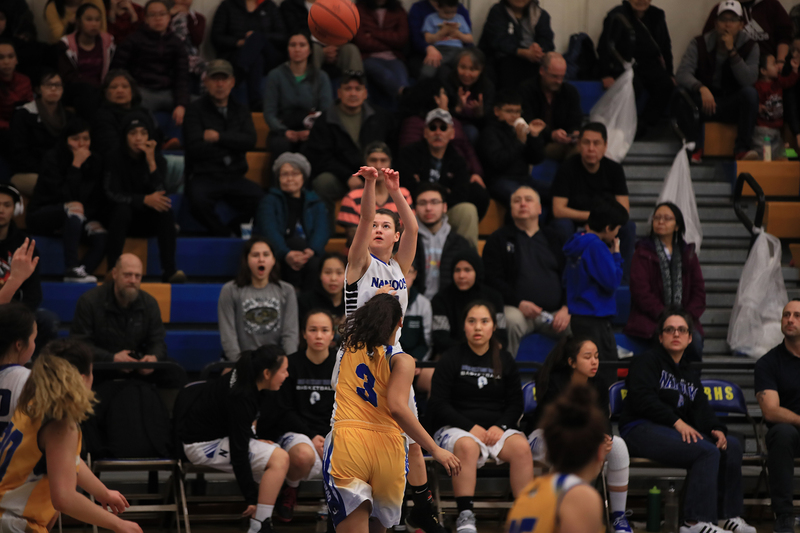 The Lady Nanooks posted an 11-10 run in the opening frame. Deja Jackson helped Bethel stay close. She buried a three-point shot as well as a shot from the paint to lead BRHS. Lieb also played well in the initial eight minutes by tossing in three. 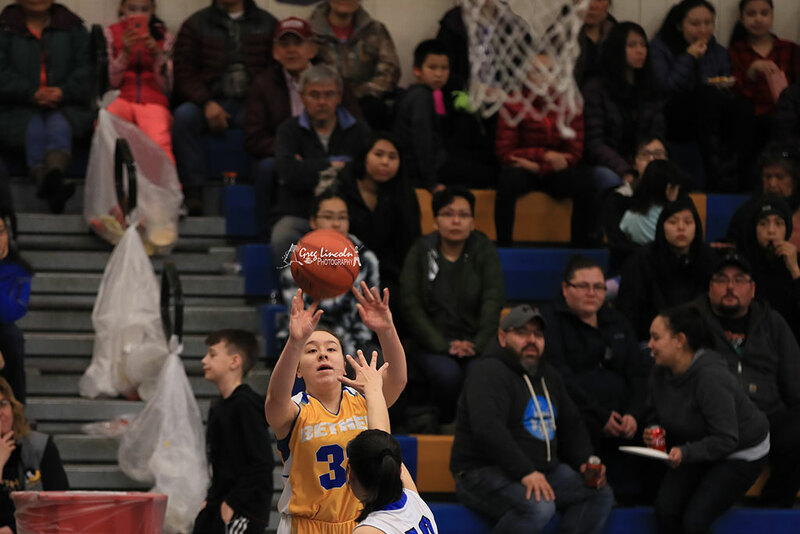 Nome stretched its lead to four, at 26-22, in the second with a 15-12 spree. Dema, who also finished the game with 16 points, scored five in the second. 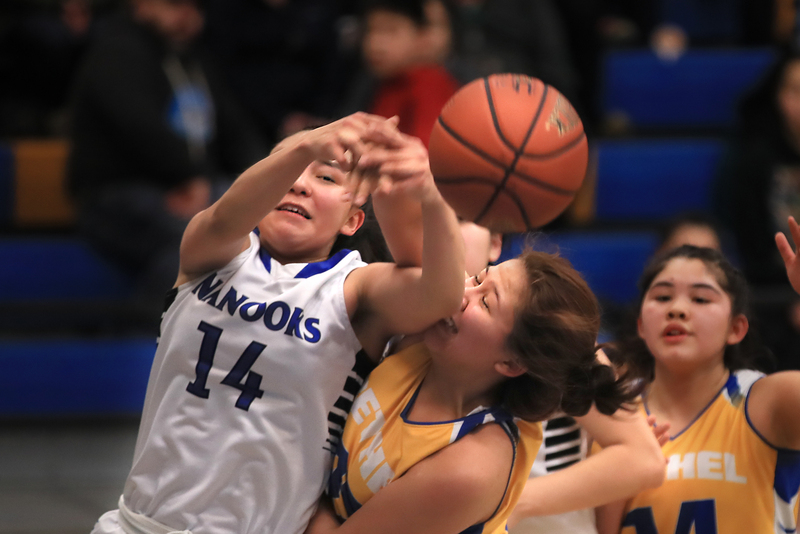 The Lady Nanooks salvaged a split on Saturday by holding off a late BRHS run to net a 50-46 come-from-behind decision. 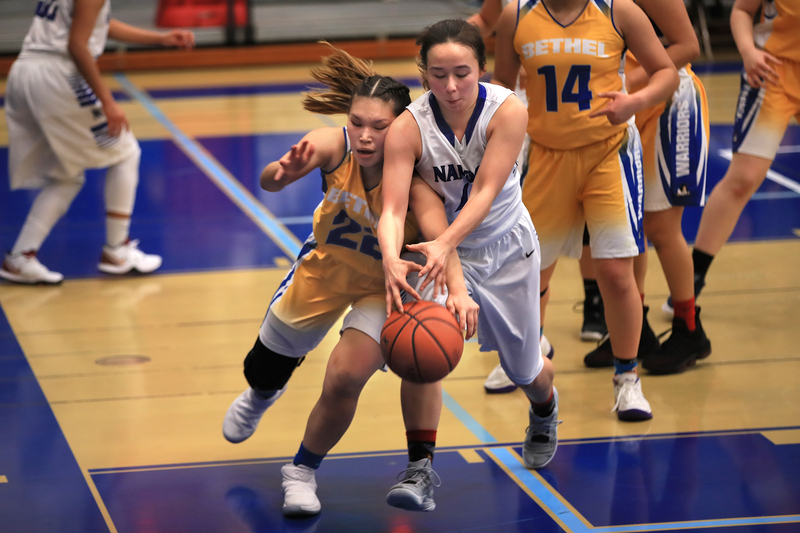 Bethel erased a 36-29 deficit at the end of the third quarter by reeling off 17 points in the final eight minutes. Evan and Jackson both finished Game 1 with double-digit performances. 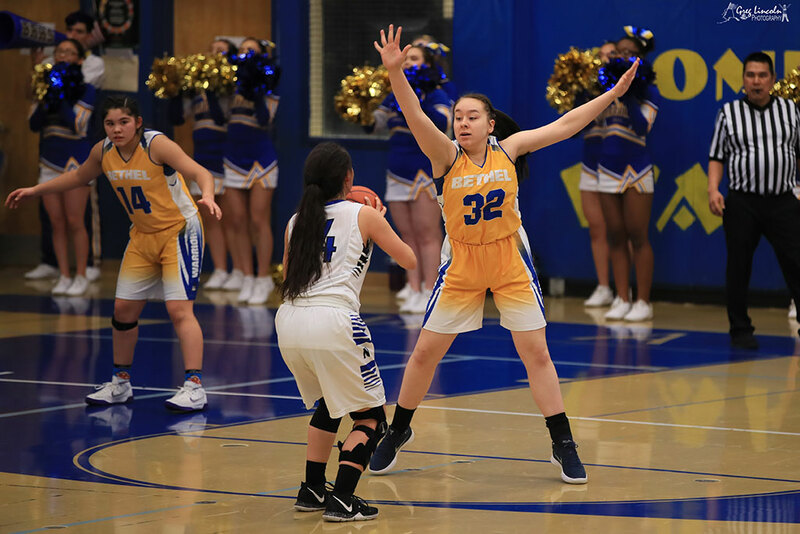 Evan scored a team-high 11 points, including six via a pair of three-point shots in the Lady Warriors’ fourth-quarter run. Jackson tallied 10. 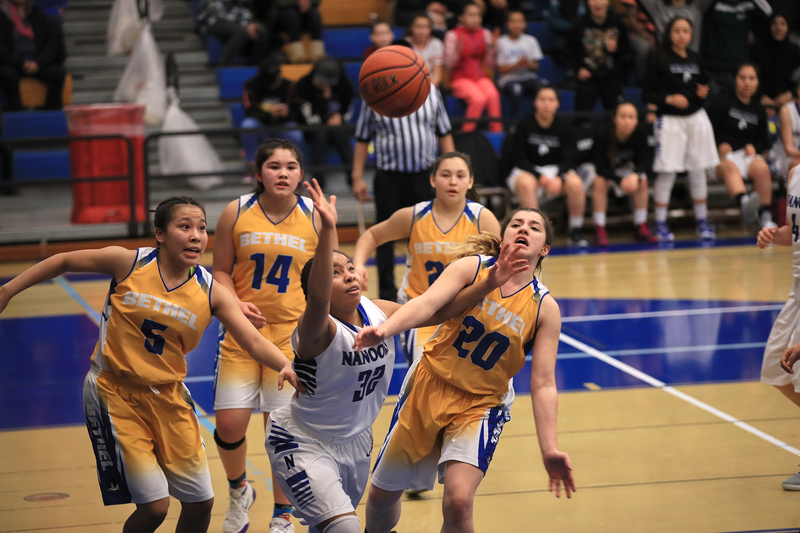 After getting off to a slow start offensively, Bethel trailed at the end of the first period by an 11-6 clip. Mute, Madison Smith and Dema tallied all of the Lady Warriors points in the opening stanza. Jackson brought Bethel back in the second. 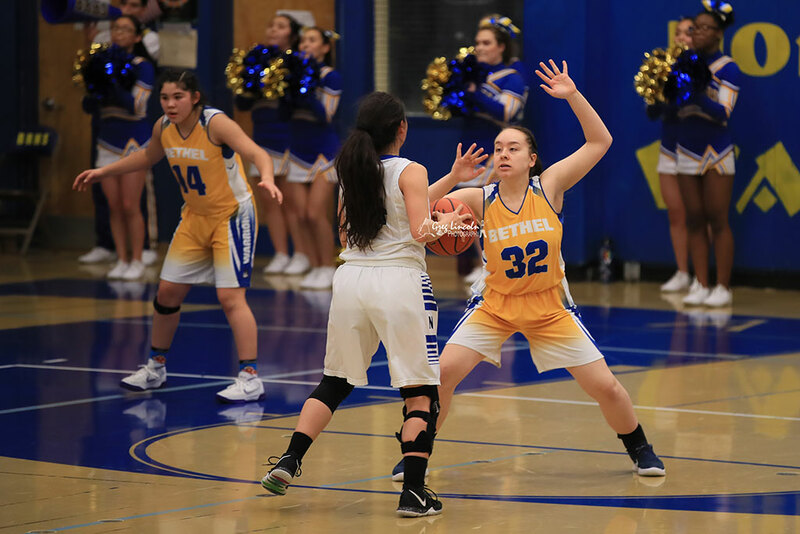 She spearheaded a 19-10 run in the ensuing frame by pouring in seven points. Mute and Evan also came up big. Mute buried a pair of treys, while Evan pushed home a three-pointer and a shot from within the paint. Bethel held a 25-21 lead at the half. Nome rallied to take the lead with a 15-4 effort in the third. 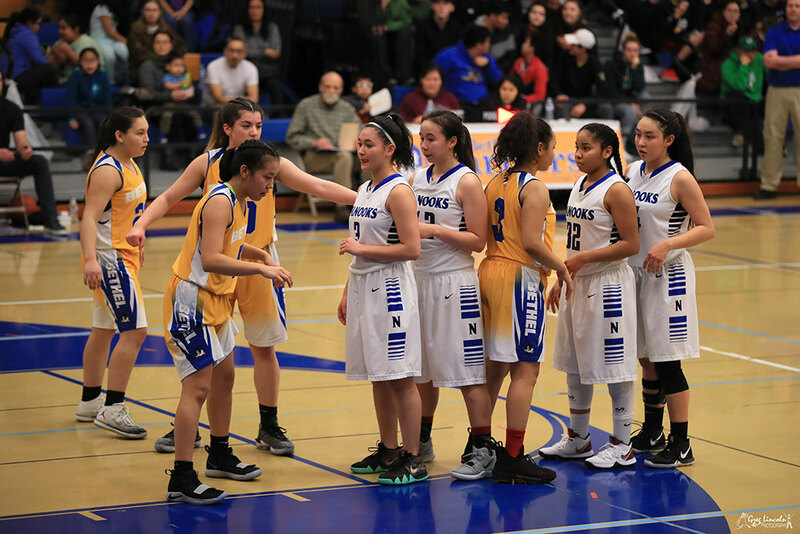 The Lady Nanooks led 41-29 heading into the final frame. Mute narrowly missed being Bethel’s third player to reach double figures. She tallied nine in the contest. Lieb added eight, seven of which came in the Lady Warriors’ second half rally attempt.